The European Cyclists’ Federation has published its estimates of the benefits of cycling to the EU’s economy. 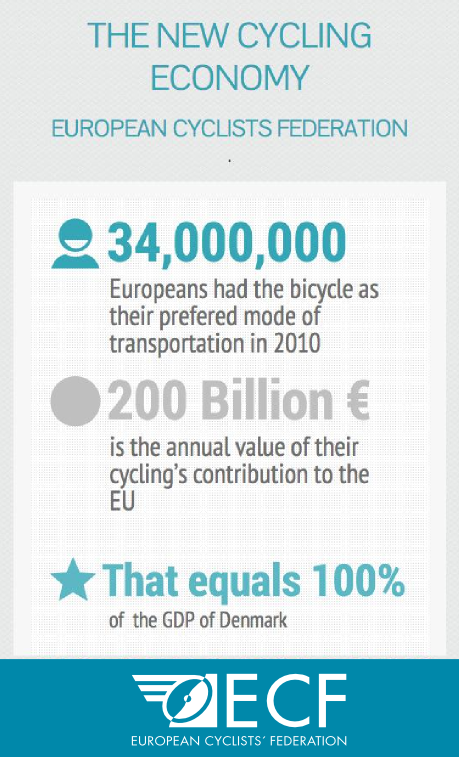 They reckon cycling generated between € 205 and 217 bn in 2010, or € 410–434 per capita. And yet investments in bicycle infrastructure around the EU is poor. On average the EU invests only €5-6 per person per year in cycling facilities and in promoting cycling – with the Netherlands leading on €25 and the UK straggling at the rear of the peleton on a measly €2 per person per year. Tut tut, EU. Must do better. Previous Four wheels good, two wheels bad?